Thanksgiving as a holiday all too often gets glossed over, and since it doesn't involve candy or presents, it doesn't make a big impression in the minds of young children. On top of that, the real purpose of Thanksgiving often gets lost amid the parades, football games, and tons of food, even though it's right there in the name. So I decided to try focusing more on that aspect, since we should all take time to appreciate all the good things and people in our lives. Sounds good, right? Unfortunately, it didn't quite work out that way. We started with our welcome song, then talked a little about Thanksgiving traditions and being thankful, then sang our story song. 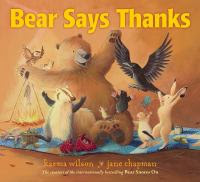 For our first book I chose Bear Says Thanks by Karma Wilson & Jane Chapman because it shows all the friends getting together and sharing food in a big dinner party, much like Thanksgiving. I also like that it shows everyone contributes according to ability, as Bear was unable to contribute a dish due to being out of groceries, but he could share stories. Jane Chapman's artwork is just beautiful in this series, and the audience can fill in saying the "Thanks!" each time, as well as identifying animals and counting Badger's fish. I followed that with a rhyme about being thankful, accompanied with using ASL signs for "thank you", "food", "friend", "sun", "tree", and "birds" which I looked up online. We are thankful for the food we eat. We are thankful for the friends we meet. the trees, the birds, and everyone! I was ready to call it a day after that, so we did our closing song and passed out stickers. To be honest, this storytime was an abysmal failure. OK, maybe it wasn't quite abysmal, but it definitely did not go well. I was tempted not to even write it up, but as "they" say, you learn more from your failures than your successes, so maybe someone else can learn from mine, as well. The Bear book was absolutely the wrong choice for this group, and I should have known that. I LOVE the Bear books so much for the gentle rhyme and rhythm, the sweet friendships, and most of all, Jane Chapman's gorgeous artwork. But, they are just not engaging enough for storytime in many cases. I keep trying, but it's very hit-and-miss, and today was definitely a miss. This particular group is very wiggly and inattention, with some it's just immaturity, but there are definitely some developmental issues and possible ADHD I think, and they ONLY do well with VERY interactive, highly engaging books that are dramatic and/or funny. Bear Says Thanks is just too sweet and gentle for them. They were moving all over the place, talking, making noises, and complaining. The same goes for the rhyme I used. Other groups have done fine with it, but this group was not the least bit engaged; they needed something with more excitement and large movements. 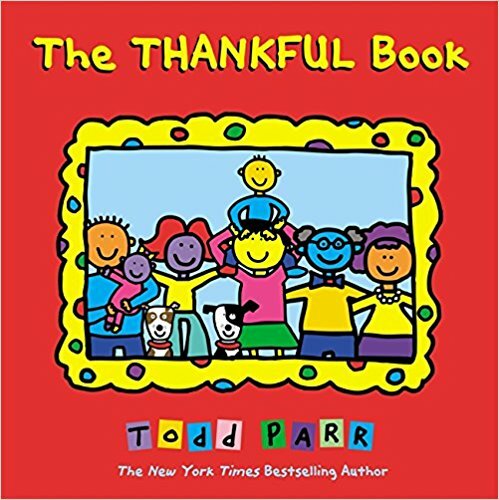 They did do better with Todd Parr's book, and seemed to respond to the bright simplistic artwork and raising their hand or commenting in agreement to each thing someone was shown being thankful for. I did get really frustrated today, which I usually don't, but the fault was mostly mine. The reason I chose such a "quiet" and gentle theme was that I somehow hurt my back a couple of days ago, and have been in a fair amount of pain. Not constant, but when I move a certain way it is pretty bad. So I was not up to doing anything with a lot of excitment and movement, but I forgot that's what this particular group has to have to stay engaged. I also thought once I was up and going my back would be better, but the pain just got worse. In retrospect, I really should have just canceled and rescheduled for next week instead. Live and learn! So, the moral of this story is (1) know your audience, and (2) sometimes it really is better to cancel/reschedule rather than trying to power through. Thanks for being honest. I've been doing storytime for years and have days when I miss the target and/or feel like I'm off balance. You have some great ideas! Just keep swimming! Thanks for sharing. We've all had story programs that just don't work with the group that shows up on a given day. 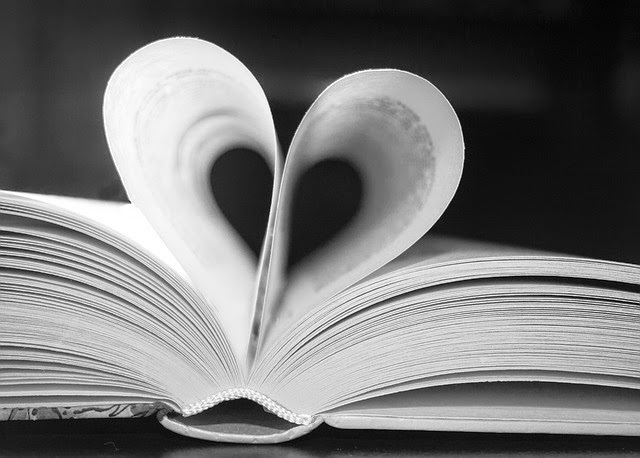 It seems to be happening more often, but I'm ok with actually stopping a story, doing a finger play/song and trying a different book. Librarians have to be flexible - both literally and figuratively! Yes, and unfortunately my physical flexibilty today was non-existent :(. Normally I would have much more interactive books for this group, and go to an activity with a lot of movement. But that just wasn't happening today! This year's class at this facility is much more challenging than the previous three. Thanks for your comments! Some books are better one on one. I think Bear Says Thanks is one of those books. I have also tried it in storytime with little success. I think so, too. I have had some success with Bear books, but it really depends on the group and their mood at that time. Bear Feels Scared seems to fare better. Thanks for stopping by!